Steven (Chicagoland, United States) on 24 April 2008 in Architecture and Portfolio. Just lovely in color and composition. Could be a painting! Bravo. what a beautiful and lovely colour! This is very exquisite with all the layers and colours! That's a great shot contrasting the traditional houses in the foreground with the modern skyline in the background. 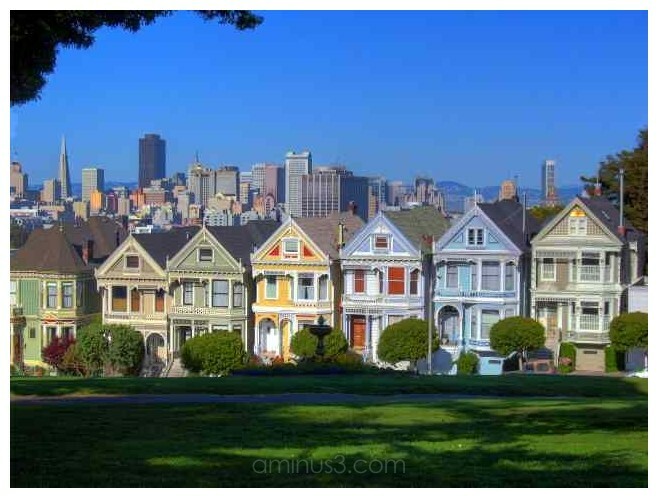 Wow, what a great skyline, including this colorful row of houses in the foreground. A great rainbow of cute buildings! Really nice! San Francisco ! I've been there in 1978, a wonderful city, and an unforgetable trip. Well now, that's a great view with those colored houses and the city behind. you got it at the perfect angle. A great contrast between the old and new buildings and I just love those old houses they are georgous. A wonderful shot Steven. This is gorgeous. I wished I would have seen that when I was there last year. Wonderful composition...the colors are lovely. I've really enjoyed beeing in San Francisco... it's been a long time ago now (1978)... Thanks for this image.